In just about every test we’ve put it though, the Flash Furniture wooden posture chair stands above the rest. Whether you’re new to knee stools or are looking for a quality, dependable upgrade, this chair comes highly recommended by our staff. In fact, most of us are owners of this great product. First things first, the customer feedback on this product is stellar. On Amazon (read reviews), where customer ratings and reviews are typically on the more pessimistic side, this product boasts a 4/5 star rating, more than any other product of its type. Our reviewers concur. The design of this chair is ideal for those with back pain that are looking to improve their condition through proper ergonomics. Like most kneeling chairs, the seat slopes downward, giving more space to the hips, which in turn allows the lower back to assume an ideal curve. 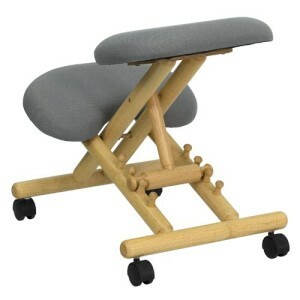 Less pressure is placed on the back since the weight is distributed between the shins and the seat. A key feature about the Flash Furniture knee stool is the ability for the user to adjust the angle of the seat. Finding just the right angle not only allows you to find the right ergonomic configuration for your body, but also helps to adjust the height of the seat. For this reason, we find this product very versatile for most body types and sizes. The adjustable feature of this product also allows you to fold the stool completely. This is extremely convenient if you would like to transport the chair between home and work. It’s compact size fits nicely in the trunk of a car. If you would like to store the product, it slides in nicely under your bed. In terms of comfort, the foam cushion is high-quality and durable. It holds up well over time and maintains a high level of comfort, even as it ages. 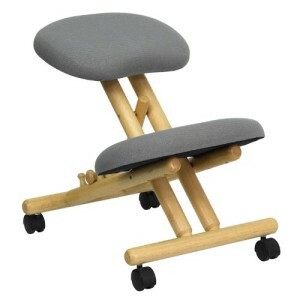 Most importantly, the price point of the Flash Furniture Wooden Posture Chair is extremely fair. For the value you get out of this product, its surprising they don’t charge more.